John Davis, left, adjunct instructor from Columbia College–Fort Leonard Wood and Safari Club International member, and Dr. David King, right, director of Columbia College–Fort Leonard Wood, present Dr. Gerald Brouder, center, president of Columbia College, with a check for $18,000 on July 20. The check represents the proceeds from a Safari Club International fundraiser held in May benefiting the Master Sergeant Evander Andrews Memorial Scholarship. Andrews served as an airman at Fort Leonard Wood and was killed on Oct. 10, 2001, the first service member to die in Operation Enduring Freedom. The scholarship will provide one or more annual awards to degree-seeking undergraduate students enrolled at Columbia College–Fort Leonard Wood. 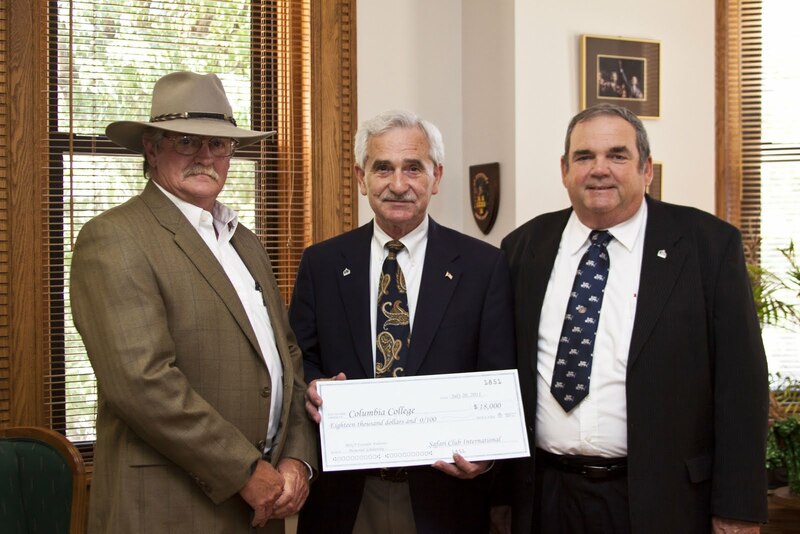 This is the first Columbia College scholarship available to children of combat veterans. 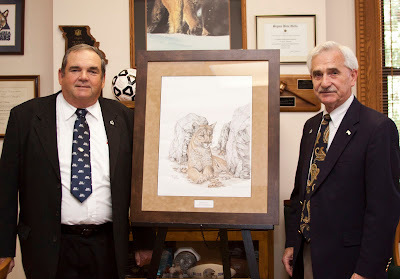 Dr. David King, left, director of Columbia College–Fort Leonard Wood, presents Dr. Gerald Brouder, right, president of Columbia College, with a Cougar print on July 20. The print was purchased by King at a Safari Club International fundraiser benefiting the Master Sergeant Evander Andrews Memorial Scholarship. Great job. Scholarship in Columbia is very appreciated, that's for sure. Great to know that 3rd world countries are supported well.